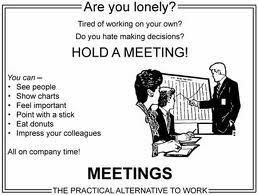 Keeping Up ... with the Joneses: Meetings! It always amazes me that a meeting is defined as an activity that involves hours and hours of tense debate, ultimately producing a result called "minutes". And this past week has had more than its fair share of meetings. On Monday we had a rather tense Community Forum meeting at the Seminary, in which Ross addressed us with a number of grave matters relating to our community living as well as other rather sensitive issues. Then on Tuesday I attended a meeting of the Circuit Executive with two of my Seminary colleagues, which was part of the viability and visioning exercise we are assisting this particular Circuit with - and it was a tense affair starting at 7pm and ending just before 11. Wednesday was the turn of our Leaders' Meeting at Prestbury, which Michael asked me to chair, and one or two sparks flew there as well. Although that one "only" lasted 2 1/2 hours, I was still pretty shattered at the end of it. Moving on to Friday, we had a dinner held in honour of Alice O'Neill who has just achieved her Springbok Scout, the highest award in Scouting. While this was not a "meeting" in the true sense of the word, there was quite a number of speeches and (once again) I only arrived back home at 11. After a mere five hours of sleep it was up again to take part in a tree-planting community project that the Scouts were involved in. This entailed a 3.8km uphill schlep through the forest paths behind Cascades shopping centre to the place where the trees were to be planted. The fact that I busted my second pair of sandals within a week, courtesy of the left sole becoming completely detached (we'll have no cracks about a Methodist minister losing his sole/soul, if you don't mind...) about 800m into the walk meant that I trekked the remaining 3km with a serious wheel alignment problem. My feet, knees, and hips were NOT happy! Thankfully I was able to hitch a lift back down. Finally, to round off the week, I was asked to attend a congregational meeting at Pietermaritzburg Metropolitan Society this morning (also to do with the Circuit exercise referred to above), which I arrived at just after 10 (having ducked out halfway through he service at Unit 14). Ross had been preaching and was planning to attend the meeting as well, but I suspect that as soon as he saw me he figured that this would present the perfect opportunity for a well-executed escape. (Ross - you owe me one!) After just over 3 1/2 hours of fairly intense debate, I hauled my sorry self back to Waalhaven, where the ministrations of my wife's roast beef, mash and veg, and sparkling grape juice re-fortified my weary soul. The rest of today was spent basking my brain with Greek, ready for tomorrow's test. At this stage I have to confess that it's all Greek to me! Languages are not exactly my forte, and since turniong 40 I seem to have lost my capacity for rote learning as well. In short, I'm up to my ankles in it, except that I'm head first. Put it this way - if some people in the Seminary are getting up to mischief (and I stress, some - by no means a majority), quite frankly I don't know where they're getting the time!